an engineer in bay area. I have a cat called Moose. I write about technical stuff in the field of computer science, with a focus on Machine Learning, my hobbies, including guitar playing and ballroom dancing, and my life in US. Some of my posts are written in Chinese. I recently worked with Matlab a lot. When in console, sometimes I want to use less to quickly examine the file content, and I have already set it up such that it uses source-highlight to output colorful escape sequence to the console. 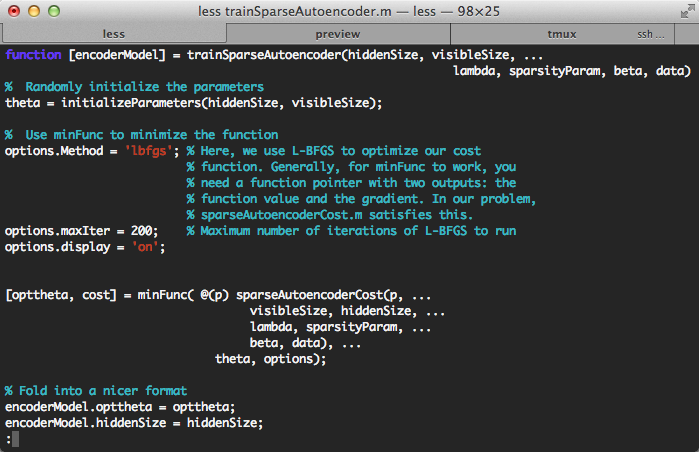 However, source-highlight does not come with a syntax support for Matlab by default. Luckily, this post and this (in Chinese) provides a solution. One of the problems that drives iOS user crazy is the user-unfriendly manipulation/syncing of photos in iOS. There are just no easy way to remove photos in batch (though you can delete the entire camera roll in the settings). I found that Safari in Mavericks is not using local proxy.pac at all. Turns out because of sandboxing, it will not allow reading file from local. A traditional solution is to turn on Web Sharing, and thus use HTTP to read the pac file such as http://localhost/proxy.pac. Also, place the pac file under /Library/WebServer/Documents, which is the default Document Root of Apache. Tom Fischer proposed another way to get around, however I don’t think it a good idea to mess around the system files. This post summarizes some common useful tips in LaTeX editing. I know that this can be easily fixed if you know a little soldering and have courage: the adapter is working perfectly fine, it is just the wires. I decided to DIY. 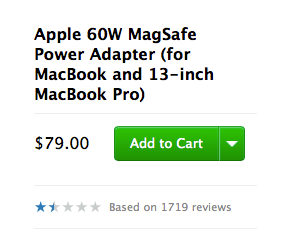 There are several pretty good articles on how to open the MagSafe and how to solder it. Without the brackets, it defaults to .themes/classic. Do NOT use rake install to install the theme again, since it will overwrite the whole thing, including the files in source/_include/custom directory. 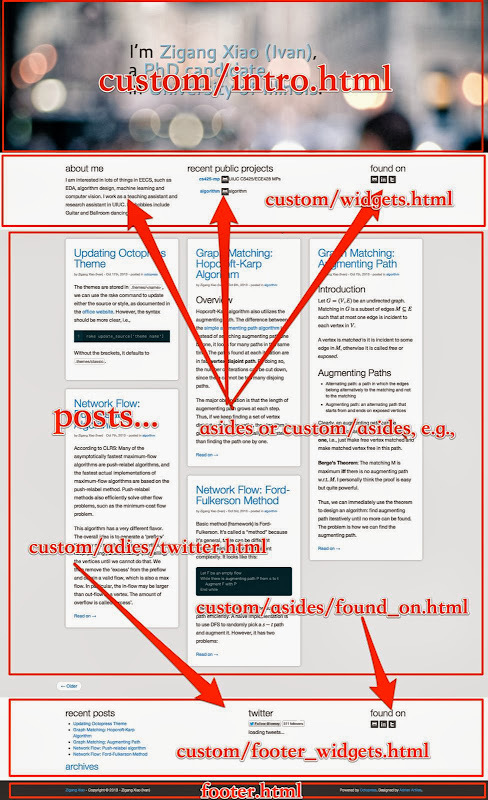 When working on the blog, anything outside of source/_include/custom should be considered the theme. Thus, do not make changes directly in source. Make changes to theme and update the theme to reflect the changes to the blog. Let \(G=(V, E)\) be an undirected graph. Matching in \(G\) is a subset of edges \(M \subseteq E\) such that at most one edge is incident to each vertex in \(V\). A vertex is matched is it is incident to some edge in \(M\), otherwise it is called free or exposed. Clearly, an augmenting path can be ‘flipped’ to increase the matching size by one, i.e., just make free vertex matched and make matched vertex free in this path. Berge’s Theorem: The matching M is maximum iff there is no augmenting path w.r.t. \(M\). I personally think the proof is easy but quite powerful. Thus, we can immediately use the theorem to design an algorithm: find augmenting path iteratively until no more can be found. The problem is how we can find the augmenting path.